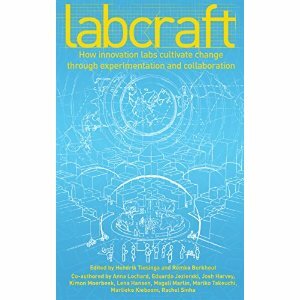 Labcraft: How innovation labs cultivate change through experimentation and collaboration is a book which illustrates ways in which labs cultivate change through experimentation and collaboration. The labs themselves are part of an emerging family of hybrid organizations which create dialogue, cross-pollinate perspectives, and create space for new things to emerge. The book was co-authored by 12 different lab leaders/facilitators of which most had not worked together before. They were brought together and produced the book in four days using the Book Sprint methodology. The authors believe that we are living in times of fundamental transition in the way we organize our societies and economies. Furthermore, they believe that there’s an abundance of untapped energy, ideas, and potential that can be leveraged to address the big challenges of our times. The book itself demonstrates what is possible when people join forces in new, innovative, and experimental ways. The authors combine their individual experiences with a willingness to represent a multitude of voices and perspectives. Together they convey an invitation to create spaces and initiatives for innovation and collaboration everywhere. The book is published under Creative Commons Attribution-Non Commercial 4.0 License. Below are excerpts (in italics) from Part III of the book, where the authors take a closer look at strategies for generating and accelerating emergent innovations. This is the part which I find most interesting. However, the book overall is well worth reading and I highly recommend the book to all who are interested in collaborative approaches! Excerpts from Labcraft, Part III: Lab Strategies, pp. 64—114. Create safe spaces. In labs, participants can come and hear views they don’t normally align themselves with; be honest about the challenges they face; and show up as individuals, not the organizations they represent. Take a birds-eye view. Find the parts of the system that don’t understand each other, and look for people doing similar work in different systems. These stakeholders usually learn the most from each other. Unexpected connections can be the most obvious ones. Sometimes it seems to make sense that two people should work together. And yet, for many reasons stemming from hierarchies and organizational and disciplinary silos, they just don’t. At the same time, some pairings or groupings that seem unlikely can become the most fruitful. Don’t take any connection for granted; you might miss some excellent opportunities. Don’t wait to be asked. Often we’re not given the mandate to convene, but do it anyway. Pull experience from everywhere. We build unexpected connections across disciplines by bringing together ideas like social enterprise, personal development, marketing, design, advocacy, and education. Get immersed. The best make-or-break observations often come when the observer is embedded in the target systems and with target beneficiaries. There’s no substitute for being there. … You can also build design skills in people who are already immersed in the context. Just asking might not get you what you need. Interviews are invaluable, but they’re only one tool in the observer’s tool kit. Users may lack the schema or even language to communicate their needs. And often they are so intimately familiar with—and invested in—existing narratives about a problematic situation, they may not be best positioned to see what would be clear to a third-party observer. Positive deviance is powerful. Staying close to users helps us fight the assumption that we must make a new thing. Instead, we commonly find that elements of the overall challenge have already been addressed by community members who successfully developed their own local solutions that deviate from the mainstream way of dealing with the problem. Hence, our efforts are better spent iterating upon and scaling these existing bottom-up solutions than reinventing the wheel. Know what you’re trying to discover. There’s a lot to be said for insights that emerge from pilots, and even more to be said about being open to being surprised. But our experience suggests that our efforts are best served when we define from the outset what we hope to learn from a pilot or trial. If it isn’t working, stop doing it. This may sound obvious, but continuing on with something when it’s clearly not working happens more often than you might think in almost every type of organization. One of the key aspects of rapid-cycle prototyping is that you simply stop doing something when you realize it’s not working, learn from that, and move on. Don’t take it personally. Labs take risks, so failure will happen. … Make sure the culture in your organization genuinely supports the notion that things won’t always work, and backs up the individuals who lead experiments. Be strict about learning. Experimentation isn’t a substitute for deeper learning. There’s no point in failing for the sake of it. It’s crucial that no matter how much you may want to forget a failed experiment, you reflect after every activity that went wrong on what went well, what didn’t, and what you’d do differently. Create communities of change agents. Participants can learn from each other as well as from you, and they’ll have a support system that remains long after you stop facilitating. Nurture accountability. Where possible, help people who are personally committed to your cause and are truly motivated to learn. People who are “told” they have to participate can be hugely disruptive to the process. Ownership can only be taken, not given. Be realistic about timeframes. Genuine capacity-building takes a long time. From the start, set expectations regarding impact. Acceleration is quicker that incubation. If you incubate concepts, rather than strategies or businesses, expect that many ideas or projects won’t get off the ground. Accelerators that support scalability for pioneers who are already innovating produce much faster results. How do we navigate the power dynamics between institutions and labs? Central to our craft is the ability to play the game while changing it. … As a result, we constantly walk a tightrope between challenging the status quo and asking radical questions using unconventional methodologies—while not alienating our own supporters and critical stakeholders. Swaying too far one way might make us irrelevant, while moving too far the other opens us to critique of “labwashing” important issues. An exercise that superficially looks like a lab process, but really only touches the surface and avoids really challenging the status quo, actually diverts scarce resources from where they could make a greater difference. To be successful, we need to “take our own medicine” and critically reflect on how we walk this tightrope. Becoming co-opted by power players and structures in the existing system is one of the greatest risks we face. When do we become so immersed in the game that changing the rules becomes a secondary goal? What we’ve seen across our labs is that these tensions, paradoxes, and questions arise constantly and must always be addressed seriously. A third level of impact comes in the form of developing new solutions, policies, technologies, business models and products (the innovations), and through building the capacity of change agents (the innovators). The involvement of change agents in our programs can range from intensive retreats and long-term incubation projects to participation in a one-day event … This aspect of tracking participants is a real struggle, as resources are scarce and capturing the impact of the many participants who pass through all of our programs is impossible. A fourth level of impact created by labs is the cultivation of new meta-narratives—the stories through which we understand society and detect opportunities for change. We act as hubs in networks of changemakers and emerging innovations, and from that unique position we can see the new stories emerging in between seemingly diverse projects and ideas. Our labs each occupy a specific position in between the old and the new, between massive challenges and emerging alternatives. These alternatives are sometimes small, sometimes even seemingly irrelevant, yet are impossible to ignore, especially in the long term. Stuck systems produce various kinds of urgencies, and one of the most prominent ones is the constant impulse to grow. … The key challenge here is to find a way to grow our impact without becoming the same rigid system we’re trying to transform. Can we work at scale and still be nimble? Or does scale imply compromise?